Winter weather predicted. Please see e-mail for important safety tips. The National Weather Service is predicting a winter storm, which will hit Second Alarmers coverage area sometime this afternoon and into tomorrow. Varying snow amounts are being predicted. Second Alarmers duty officers are monitoring weather conditions and are prepared to put extra emergency crews on the street if needed. 1. While stocking up on food and supplies, please remember to include medications or medical supplies you or those you care for may need for a few days. 2. If you or someone you care for is on home oxygen make sure the system is fully functional and that you have enough emergecny reserves to last a few days in the event of a power outage or other malfunction. 3. Please be careful shoveling and clearing snow, especially if you have a history of cardiac or respiratory problems. Take frequent breaks and stop immediately and call 911 if you begin to experience chest pains or difficulty breathing. 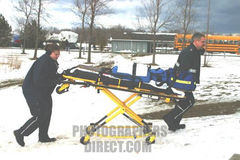 Remember emergency responses may take longer than normal in the snow, so don't wait until it is too late. 4. When shoveling and clearing snow from your sidewalks, please consider trying to clear a path at least 36" inches wide that will allow access to your house. Should EMS need to respond to your home, this will make it faster and safer for us to get our medical equipment in and the patient out. 5. If the storm is as severe as predicted, if at all possible stay home and stay safe. Sit back and enjoy a nice cup of hot cocoa and watch a movie. Keeping emergency roadways open and free of traffic is extremely important so that our emergency crews can get around to help those in need. Have a happy and healthy 2011.